By Peter McFarlane, McFarlane Strategic Services, Chief Investigator of project OL13007 – Australian Olive Industry Code of Practice Implementation, and Code of Practice (OliveCare™) administrator. Note: OL13007 is funded from the olive levy through Hort Innovation, with matching Commonwealth government funding, and industry “in kind” and financial contributions. Monitoring industry compliance with The Australian Standard for olive oil (AS5264-2011), the ANZFA Food Standards Code, and Australian Consumer Law (ACL), through undertaking regular National Market Surveys. Providing a framework for industry commitment to product quality, authenticity and provenance through the Code of Practice (OliveCare™), backed by a suite of Certification Trade Marks for use on olive products in both domestic and export markets. Building olive industry capacity and skills and through development and delivery of competency based e-learning modules, and other training activities including Tastebook sensory training. As a key component of OL13007, the Code Administrator commission’s regular market surveys of olive oil products offered for sale in Australian retail, on-line and food service sectors. 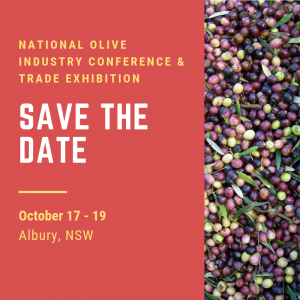 The program aims to support quality, authenticity and consumer confidence in the Australian olive industry and its products. Over the past 3 years, a total of one hundred and eighty five (185) Australian and imported olive oils labelled as evoo were purchased from supermarkets, independent retailers, wholesalers, farmers markets or ‘on-line’. All samples were selected, dispatched and tested in accordance with AOA Code of Practice (OliveCare™) protocols. AOA now holds on file over 5 years of market survey test data representing a total of 382 evoo samples (192 Australian and 190 imported). All samples were independently tested by NSW DPI Wagga Wagga, (a National Association of Testing Authorities, Australia (NATA) and American oil Chemists Society (AOCS) accredited laboratory, and International Olive Council (IOC) accredited sensory panel), for selected chemical and sensory parameters for compliance against the Australian Standard for Olive Oil and Olive-Pomace Oil AS5265-2011 (AS) , as well against the International Olive Council Trade Standard applying to olive oils and olive-pomace oils(IOC) , COI/T.15/NC No 3/Rev.11 July 2016, and EU Regulation No 1348/2013(EU) . Laboratory testing includes: Oil Chemistry: Free Fatty Acids (FFA), Peroxide Value (PV), Ultra-Violet Absorption (UV) – (DK, K232 &K270) – (using wet chemistry for imported samples, and IR for Australian samples), Oil Freshness: Pyropheophytin A (PPP’s), 1,2 Diacylglycerols (DAG’s), plus Sensory Analysis for defects undertaken in accordance with the International Olive Council Method for the Organoleptic Assessment of Virgin Olive Oil, COI/T.20/Doc. No 15/Rev. 7, February 2015, by an IOC accredited panel. In the July 2017 market survey all samples were also screened by the a government laboratory – the National Measurement Institute (NMI) for pesticide residues (Supermarket Screen Lists 3 and 5 – Combined GCMS/LCMSMS) covering contaminates, organochlorines, organophosphates, herbicides, acaricides, fungicides, phenols, carbamates, synthetic pyrethoids, insecticides, and plant growth regulators, and assessed against the Australia New Zealand Food Standards Code Schedule 20 – Maximum residue limits. This report covers market survey testing undertaken in July 2017, during which fifty (50) products labelled as EVOO were purchased from supermarket outlets in South Australia. The stated origin of the selected products is Australia 26, Imported 24. With a comparison with 2015/16 survey data provided. Of interested the average purchase price in the July 2017 survey for the imported products was $13.50 / litre, and for the Australian products $20.00/lit, indicating Australian evoo is receiving a premium. The July 2017 supermarket survey found that 63% of imported brands met the quality requirements (chemistry, sensory and freshness) for classification as evoo, up from a low of 21% in 2015/16. This compares with 73% of Australian products that met the quality requirements (chemistry, sensory and freshness) for classification as evoo, up from 57% in 2015/16. 4 products (8%) tested as Lampante (2 imported and 2 Australian), compared with 22 products (34%) in the 2015/16 survey (16 imported and 6 Australian); these products are regarded as not fit for human consumption without further processing. A further 12 (24%) products (7 imported and 5 Australian tested as virgin olive oil compared with 18 products (28%) in the 2015/16 survey (11 imported and 7 Australian); whilst this oil is edible, it is of a lesser quality and unless stated on the label is not what consumers have paid for. 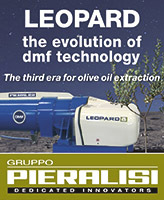 All product failures will be addressed directly with brand owners, these failures include not meeting evoo chemistry test parameters (8%) – down from the 19% failure in the previous year, sensory defects (18%) – down from the 53% failure in the previous year, and failure to meet freshness parameters (30%) – comparable to the 27% in the previous year, with the biggest improvement being in sensory defects in imported olive oil – down from 74% in 2015/16 to 12.5% in 2017. One area of concern is both Australian and Imported brands routinely overstate product BBD as 2 years from bottling. Most products tested were from the 2016 season, with freshness testing in July 2017 indicating many products have less than 6 months potential shelf life remaining. Pesticide residues were found not to be a major problem with only 2 products (1 imported and 1 Australian exceeding a MRL), and two olive oil products that had a label claim of ‘certified organic’ (1 imported and 1 Australian) were found to have pesticide residues. 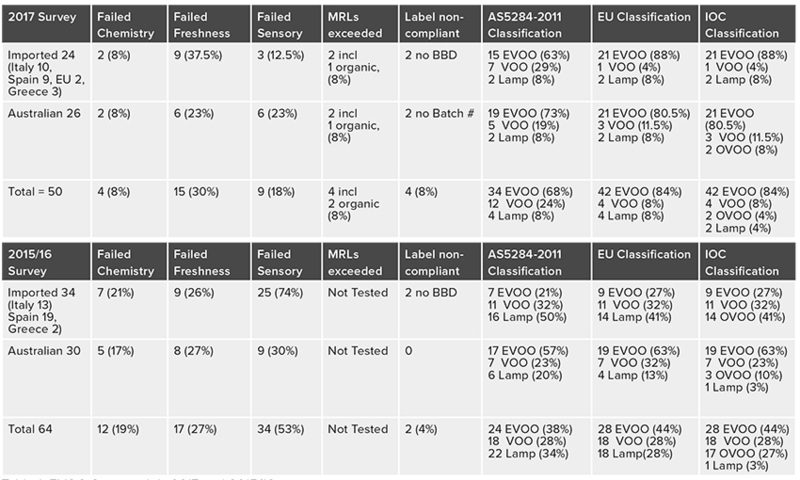 Australian EVOO products (192) samples – with 69 (36%) failing to meet the Australian Standard for evoo classification- with re-classification of 38 (20%) as VOO and 31 (16%) as Lampante. 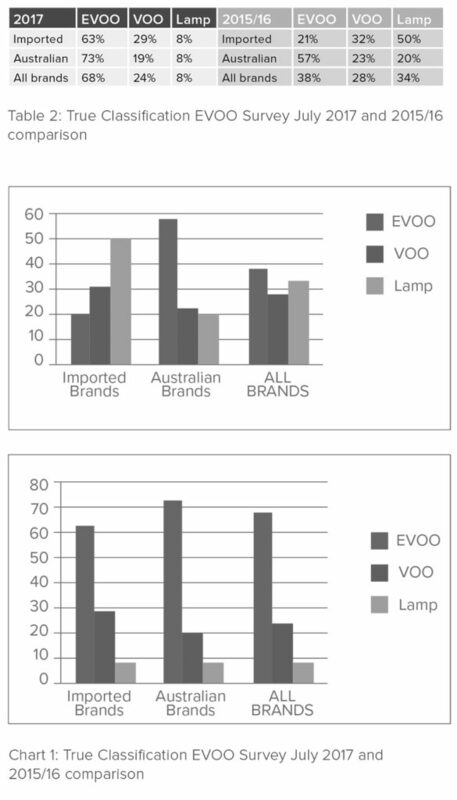 Imported EVOO products 50% (190) samples – with 127 (67%) failing to meet the Australian Standard for evoo classification – with re-classification of 78 (41%) as VOO and 49 (26%) as Lampante. 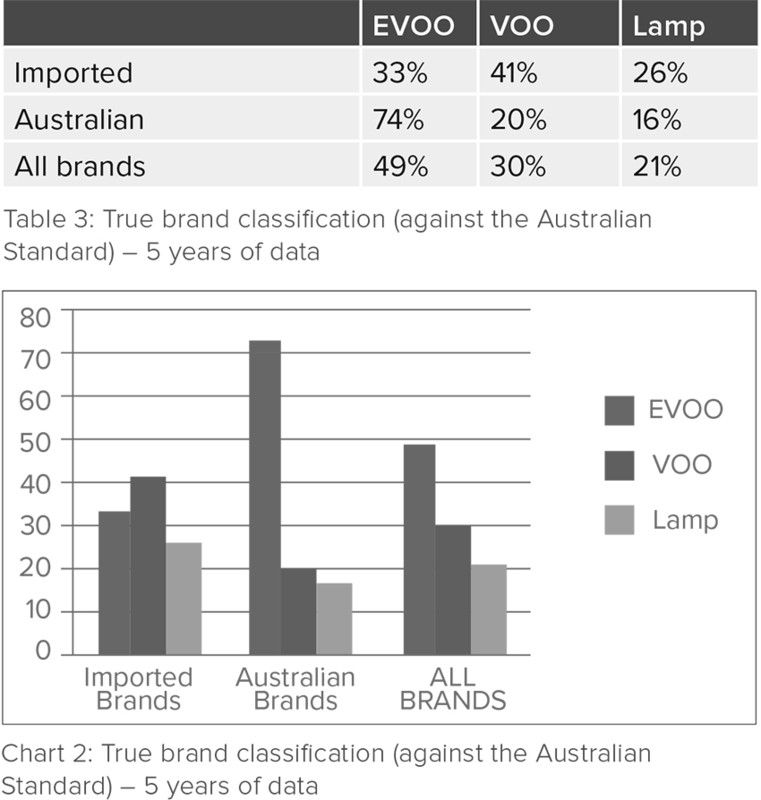 Total of 382 EVOO product samples – with 196 (51%) failing to meet the Australian Standard for evoo classification – with re-classification of 116 (30%) as VOO and 80 (21%) as Lampante. 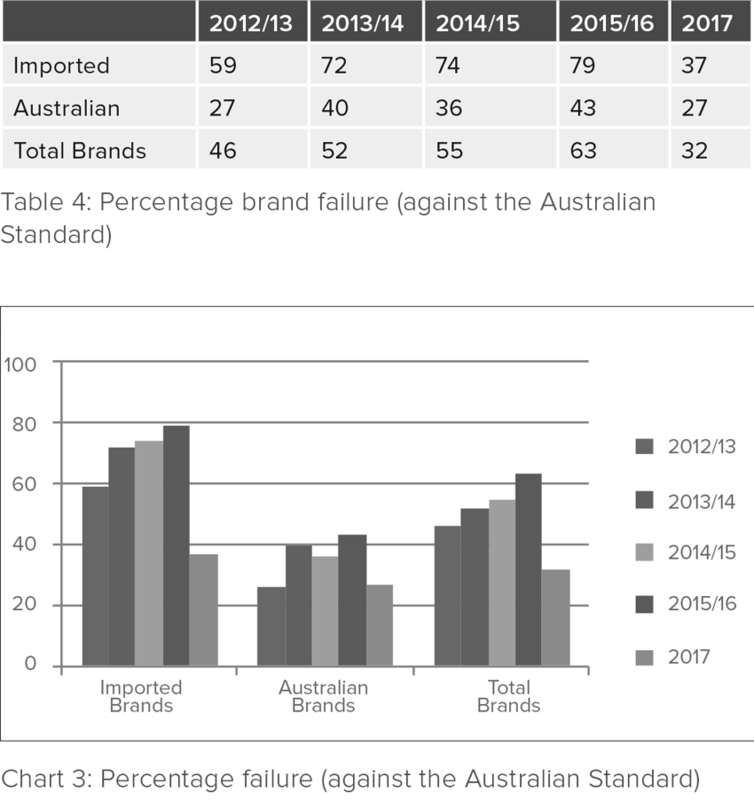 The data indicates that Australian evoo product failure (as measured against the Australian Standard ) has been between 26% and 40%, whereas imported brands have made a dramatic improvement in 2017 to 37% from a high failure rate of 79% in 2015/16. 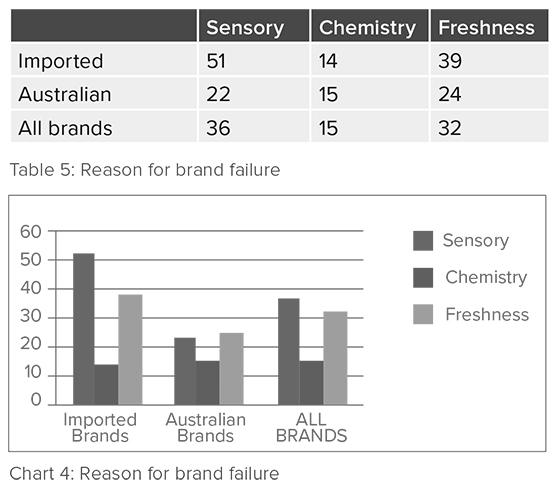 Adjusting for market share – Australian supermarket brands have 46% market share with only 4% failure rate by volume against AS evoo specifications, largely reflecting the market dominance of BBL brands (Cobram Estate and Red Island), whereas imported supermarket brands have 54% market share with a 70% failure rate by volume against evoo classification under the Australian Standard. The July 2017 survey results are a very significant improvement for imported EVOO products over the previous (2015/16) survey results. This improvement may be a reflection of low inventory in Europe that now requires fresher product to be shipped to markets including Australia. Sensory Defects (all standards): A total of 139 (36%) of the 382 products (42 (22%) Australian and 97 (51%) imported) exhibited negative sensory attributes (defects), including: muddy sediment, and rancid, with many also having zero fruity attribute, variously reflecting poor fruit quality and or processing methods, or poor product storage conditions. Chemical Analysis (all standards): A total of 56 (15%) of products (29 (15%) Australian and 27 (14%) imported) failed one or more of the chemical test parameters: Free Fatty Acids (FFA), Peroxide Value (PV), Ultra-Violet Absorption (UV) – (deltaK, K232 &K270), variously reflecting poor fruit quality, poor processing methods, poor product storage conditions, secondary oxidation and use of refining methods (detected in several imported oils). Freshness Analysis (Australian standard only): A total of 121 (32%) products (46 (24%) Australian and 75 (39% imported) failed Pyropheophytin A (PPP’s), and / or 1,2 Diacylglycerols (DAG’s), which are proven and useful measures of determining EVOO quality and freshness, as well as the detection of deodorised oils. Australian olive oil producers should not ‘rest on their laurels’ – imported olive oils are overall much improved. This observation vindicates the Australian olive industry pursuit of quality and freshness, and truth in labelling to ensure that consumers continue to receive value for money for their purchase of evoo (which contains the highest levels of anti-oxidants and other healthy ingredients). Olive oil producers and marketers should give increased attention to stock control, 30% of evoo failed freshness testing (37.5% imported and 23% Australian products). The survey freshness testing demonstrates that many evoo products have less than 24 months of potential shelf, sometimes a low as only 12 months. The industry practice of routinely applying a 2 year Best Before Date on evoo without supporting test data is therefore strongly discouraged. Producers and marketers should ensure unique lot numbers and realistic BBD information is included on product labels. Ref: Determining shelf life: how can small growers do it on a minimum budget? By Leandro Ravetti, Technical Director Modern Olives, published in the Australian & New Zealand Olive Grower and Processor, September 2017. Producers should always use pesticides in accordance with product label / APVMA permit directions, and organic certification requirements. The Code Administrator will work with Signatories with failed products to identify causal factors and propose rectification requirements, as well as providing constructive feedback to other non-certified brand owners. The Australian Olive Association Ltd is now the owner of the Trade Mark ‘OliveCare™’. AOA’s Code of Best Practice has been renamed and relaunched as OliveCare™, encompassing the entire olive supply chain from growers to retailers. OliveCare™ was developed to underpin and enhance the high quality of all Australian olive products and associated production processes. All existing Code Signatories automatically transition to OliveCare™, and are required to meet similar compliance requirements as under the previous Code of Best Practice. Any financial member of the Australian Olive Association may apply to become a Signatory to OliveCare™, and or OliveCare™ Export (more on this later). 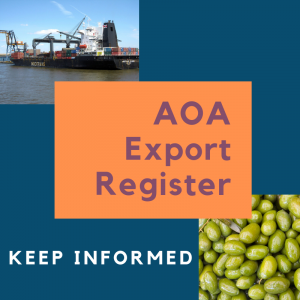 Signatories wanting to upgrade their membership (at no additional cost) to ‘OliveCare™ Export’ need to complete the new membership application form, declaration and checklist. OliveCare™ is developed to underpin and enhance the high quality of all Australian olive products and associated production processes. 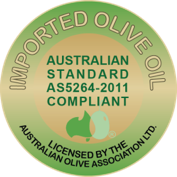 OliveCare™ incorporates the provisions of the Voluntary Industry Standard for Table Olives in Australia (RIRDC 2012), the Australian Standard for Olive Oils and Olive Pomace Oils (AS5264-2011)® as well as provisions of the Australia New Zealand Food Standards Code and related legislation, Australian Consumer Law (ACL), comprising the Competition and Consumer Act 2010, and related State and Territory food safety and health legislation; as well as international rules and codes with similar aims, such as those of the American Oil Chemists Society (AOCS), International Standards Organisation (ISO), and International Codex Alimentarius Commission (Codex). OliveCare™ comprises a set of guidelines detailing industry best practice encompassing on-farm operations – including production, harvesting, and sustainable natural resources management, as well as post-farm operations including olive processing, oil storage, packaging and product distribution. OliveCare™ provides the tools to establish a framework that encompasses good business practice with HAACP-style production controls, on-farm biosecurity and pests and diseases management. 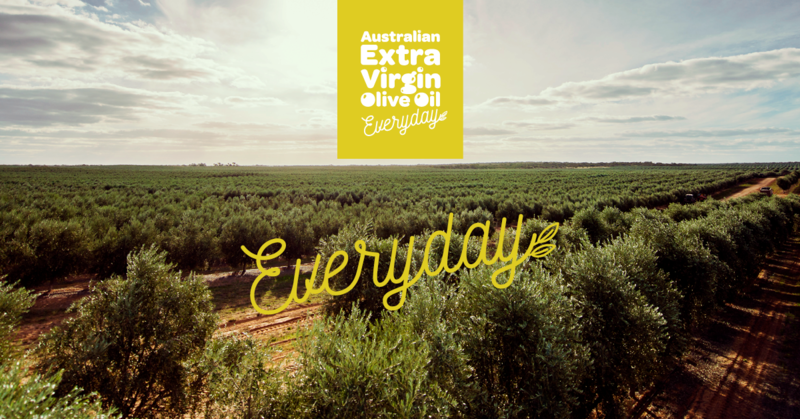 OliveCare™ encompasses high quality Australian olive oils, flavoured oils, table olives and other olive products. OliveCare™ is supported by a set of Certification Trade Marks (CTMs) owned by the Australian Olive Association Ltd (AOA). The rules governing the use of these CTMs are regulated under Section 173 the Trade Marks Act 1995 and are subject to approval by the Australian Competition and Consumer Commission (ACCC). The AOA vigorously defends its Intellectual Property (IP), including any unauthorised use and misuse of its CTMs, and will seek legal remedy where this occurs. To gain and maintain OliveCare™ accreditation, olive businesses must undergo an independent audit and evaluation on an annual basis to ensure the integrity of the program is maintained. What are the benefits of becoming a Signatory to OliveCare™ ? Once OliveCare™ accredited, a Signatory achieves formal recognition of their commitment to continuous improvement, underpinned by a professional best practice system that aims to consistently provide high quality products to consumers. OliveCare™ Signatories are provided with technical support and training to help them become more competent producers of Australian EVOO. OliveCare™ Signatories receive generous discounts to enter the Australian International EVOO and Table Olive Competitions. Participation in accredited competitions can also be used to satisfy the OliveCare™ requirement to have EVOO products organoleptically tested. 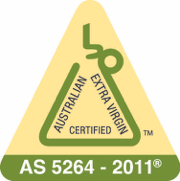 The AOA’s Consumer Awareness programs such as “Australian Extra Virgin Everyday” are linked to the AEV® logo – which consumers are encouraged to look for as their guarantee of product authenticity, provenance and quality. As consumers become increasingly concerned about product fraud and product safety, the value of membership of OliveCare™ is also enhanced. OliveCare™ provides a useful vehicle to support good production and marketing practices, to provide assurance to consumers and help meet regulatory requirements. (c) differentiating their products from lower quality offerings. Market survey testing shows that there are products being sold in supermarkets and other retail outlets and markets that claim to be Australian EVOO when they are not. The only way that the AOA can confidently ask consumers to buy Australian EVOO over other options is to encourage them to look for the AEV® logo on the product label. The project has worked with River Murray Training (RMT) a Registered Training Organisation (RTO) to develop a suite of six (6) accredited e-learning modules to support the Code of Practice, including implementing a HACCP Style Food Safety / Food Quality Plan, Export readiness training, and Sensory assessment training for competition judges of evoo and table olives. All e-learning modules are designed to link to relevant national training competency standards that fit within the requirements of Certificate III in Food Processing (FDF30111). Six olive industry enterprise trainers have been trained by RMT to build industry capacity to deliver Code of Practice training modules to olive producers which will be undertaken in collaboration with state and regional olive industry associations. Trainers have completed TAESS00007 Enterprise Trainer – Presenting: This nationally accredited skill set is the minimum qualification required by the National Skills Standards Council (NSSC) for workplace trainers and is specifically designed for people who train others in the workplace, including coaching of individuals or small groups. To become a qualified trainer, participants need to complete two units: TAEDEL301A Provide work skill instruction and BSBCMM401 Make a presentation. Interested participants need to register with Gill Ireland at River Murray Training on 0409 280 387 or ireland@r-m-t.com.au to be issued with a username and password to log onto website that hosts the e-learning program. Tastebook is a sensory training initiative in appreciating, describing and understanding how to improve the quality of evoo and table olives. Tastebook includes tasting of olive oils and table olives, assessing their characteristics, and providing feedback on the style, quality and uses of the sample products that aims to expose industry participants to regular sensory experiences and palate calibration for olive products, and to assist in gaining an understanding of how to achieve product excellence. Tastebook aims to encourage a conversation on judging methodology and enables benchmarking of participant performance against senior judges. Participants are also encouraged to benchmark their own products against the samples provided. 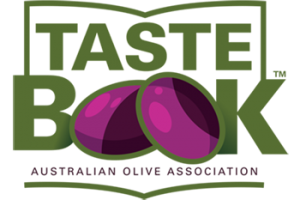 Tastebook is a component of a broader professional development platform for competition judges that proposes to include Masterclasses for evoo and table olive judging as well as annual refresher courses, and an expansion of the National Young Judges Program. Provide regular tasting experiences and training to upskill an expanded pool of Australian evoo and table olive judges within the AOA judges training and accreditation framework. Integrate training with the e-learning modules which are linked to Units of Competency from the National Training Framework (NTF). Improve industry awareness, knowledge, skills and capacity in sensory assessment of evoo, table olives and other olive products. 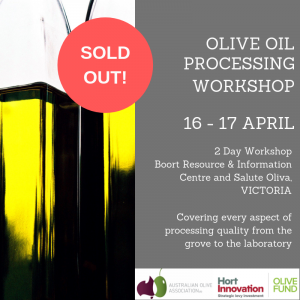 Increase exposure of the Australian olive industry to International events and expertise. Outputs from The Tastebook program will include a publication which will serve as a future training guide for competition judges. In each round of The Tastebook we also invite competition judges to share their experience and judging skills. Subject to available funding we aim to send out samples on at least a quarterly basis to all national, state and regional competition judges and associate judges, as well as to trainees including young judges and AOA Code of Practice Signatories (now rebranded as OliveCare™), and to other interested industry participants. Tastebook surveys are completed on-line through Survey Monkey, with results analysed and provided to participants by Dr. Soumi Paul Mukhopadhyay a sensory and consumer scientist now based at DPI Wagga Wagga. AIM: The Australian Olive Industry National Young Judges Competition is aimed at involving school students in learning to evaluate Extra Virgin Olive Oil. HOW IT WORKS: The Competition is the brainchild of Kent Hallett from Olive Oil Packaging Services (SA) and currently involves five schools in SA and 45 students and their teachers. The students take part in the training exercises as part of their normal lessons and during non-lesson time. A qualified judge reviews the training oils and develops tasting notes for the students. The oils chosen are interesting and cover a range of flavours and styles. After the training, the students are invited to take part in the judging process at their nearest State/regional Competition as Associate judges and to help with the stewarding of the show. SKILLS: Students are asked to place the oils in the same order and with similar scores to those that they received in the state/regional show. The competition involved smelling and tasting four unidentified olive oils, judging them on nose and palate. Students then individually marked them out 20 and made notes based on fruitiness, bitterness, pungency and transition. After, teams come to a census on each olive oil and rank them. The team to score and rank each oil closest to the professional judges wins. Students work in teams of three and can compete in either the Novice section, which is for students who have not won previously, or they can enter the Advanced section if they have won a ribbon in previous years. Awards are made to the Champion, Reserve Champion and third place for the Novice and Advanced teams and also the Individual section. It is common for one or more students to achieve a perfect score. In this case, to break the tie, they are asked to address the senior judges and justify the scores that they have awarded. PRIZE: The Champion and Reserve National Olive Conference in the year following their win. They are also invited to take part in the Australian National EVOO Competition as an Associate judge and also get to work with the Chief Steward, learning the ropes on how to set up and run an EVOO competition. Both judges and officials at this competition have commented on how dedicated and knowledgeable the students are, and also on how well they present themselves. Whilst the competition currently involves only SA schools, Kent and the AOA propose to roll out this great industry education initiative nationally and to include table olives and skin care products.